I grow the large blue flowering Agapanthus at the top of the driveway border, where they are nearly underneath a large gum tree. The soil there is quite dry and yet these plants seem to do well. I love their clear green foliage. 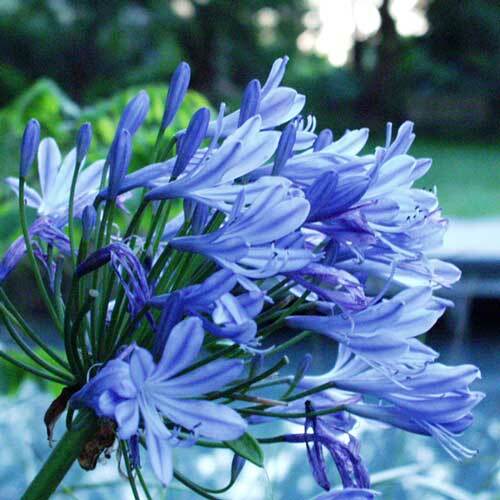 Of course Agapanthus in flower is a beautiful sight. A bright pink Flower Carpet rose keeps my Agapanthus company but unfortunately the two don't get their flowering times to coincide. 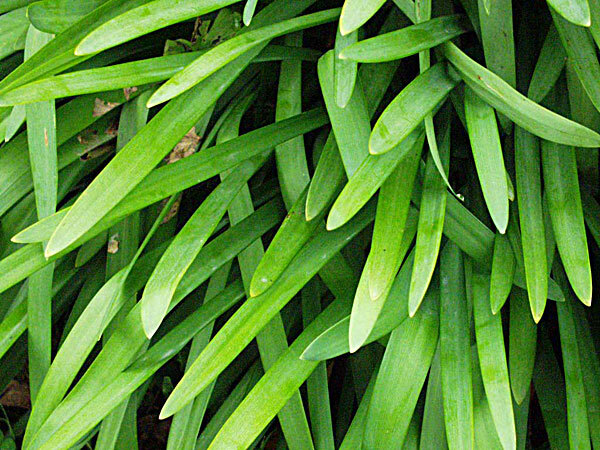 Agapanthus have very nice foliage - that's why I've included them in this foliage section. I grow small and large varieties, and many of my clumps flower sparsely. That's completely my fault - I've planted them underneath trees, and they don't get enough sun. The long mid to dark green strappy leaves of Agapanthus are used in my garden to contrast with round-leafed neighbours. The dwarf agapanthus look particularly good planted in the middle of smaller hostas.